I particularly like the way Ned has positioned himself so that it appears that Mini-Ned is riding him up a hill climb. 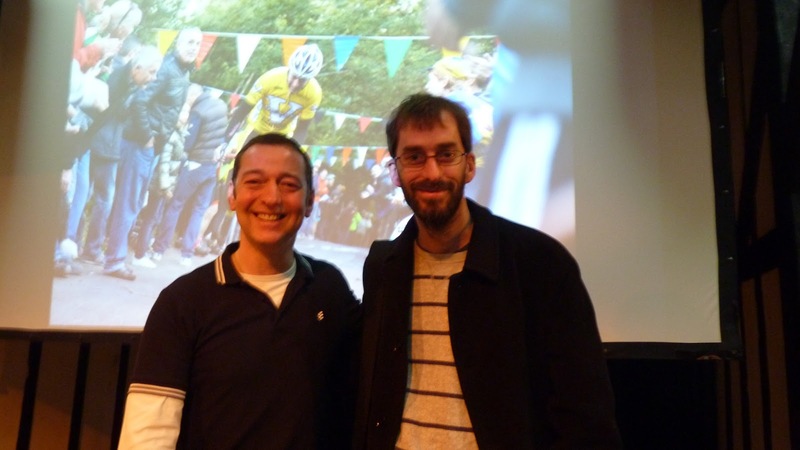 Ned Boulting gave a one-off talk yesterday afternoon in Walton-Upon-Thames, covering his ten years as a cycling journalist, his thoughts on the sport's current troubles, a Q&A session and a reading from his upcoming book about Britain's cycling boom, On The Road Bike: The Search For A Nation's Cycling Soul. He comes across in real life as a chattier version of the man on the telly. Engaging, droll, self-deprecating, a smart man occasionally feigning bewilderment for comic effect.What was surprising was how candid some of the opinions he offered were. The urge to repeat them here is overwhelming, but I'm pretty sure some of them were actionable, so I won't. It was nice to hear him offering those opinions though-it was a step away from traditional journalistic detachment made all the more interesting as you knew it was underpinned by journalistic access. To put it another way, he politely said the same things a lot of sweary cycling fans say on internet forums, but with the important distinction that he actually knows what he's talking about. Perhaps the only downside was the number of doping-related questions during the Q&A. It would be terrible for cycling if cycling fans went back to pretending doping wasn't an issue, but it's equally depressing that in a room full of cyclists and cycling fans - the people who love cycling the most - the focus is almost entirely on the negative aspects of the sport. Ferreting out and punishing dopers is vital to saving the sport, but it would be nice if we could remember why we want to save it. A room full of cycling fans should spend more time discussing breathtaking climbs, moments of inspiring bravery, lightning finishes and tactical battles than they do digging over who got caught doping and who hasn't been caught...yet. On the subject of ferreting out dopers, one of the few things where I slightly disagreed with Ned was his suggestion that cycling should stop pointing the finger at other sports and concentrate purely on cleaning its own house. This is in light of Eufemiano Fuentes offering to name the footballers and tennis players he's worked with, but being told by the Operacion Puerto judge Julia Santamaria that he's only obliged to reveal the names of cyclists. My main objection to the idea that cycling shouldn't be rattling anyone else's cage is right there in that summary. I don't want to see a situation in which justice is seen to be done because we've thrown another couple of cyclists on the fire. I don't want international governing bodies or national sports ministries butchering cyclists so that they can claim to be winning the fight against doping whilst ignoring doping in bigger, wealthier sports. Fuentes has said in the past that if he named all the sportsmen he worked with, Spain would be forced to hand the World Cup back. Most of us suspect they'd have to give back a few tennis trophies too. But those are high-profile sports so let's just conveniently scapegoat cycling. This scapegoating has a more serious knock-on effect than just being dishonest and unfair, it undermines the whole fight against doping. For every fifty or a hundred athletes who are doping, there aren't fifty or a hundred dodgy doctors and pharmacists supplying products and expertise on a one-to-one basis. Every doping ring has a hub, a few crooked individuals supplying the needs of hundreds of cheats from dozens of sports. Smashing these hubs is of infinitely more value than simply banning their clients (although we should continue doing that too). Compare the financial worth of cycling to that of football or tennis, compare the individual wealth of the sportsmen who might be paying for PEDs, and then explain to me how choking off the comparatively tiny revenue stream that doping doctors must make from cyclists will shut them down when they can expect a weekly visit from some teenaged multi-millionaire from the Premiership or La Liga with a wad of cash and the cocky assurance that their own governing body is desperately looking the other way. Providing PEDs and doping expertise needs to be made into a high risk, low profit activity, and that means choking off the money flowing in from all sports, not just cycling. If you want to defeat doping, you have to attack it on all fronts. That means investigating all sports. That means banning cheating athletes, guiding youth teams down ethical pathways, getting cheating doctors struck off, getting cheating pharmacists shut down, getting sponsors to make statements about valuing ethics more than results, and making the whole process as unprofitable as possible by attacking the big money sports instead of just scapegoating cycling. Sorry, wasn't I talking about how much fun Ned Boulting is? Got a little sidetracked there. Still, Ned Boulting: clever, funny and engaging. If he's doing a book tour or reading near you, definitely go and see him.